Do you have ‘a song’ with your special someone? I’ve had lots of songs in previous relationships that reminded me of that person or that we liked together, or that they introduced me to, but my husband, Nathanial, is the only person I’ve ever had ‘a song’ with. I happen to think we have the best song ever because not only does it remind me of him, and has oddly specific allusions to our own relationship, but I just flat-out love the song. Even during our worst of off times, the ones where I just hated him (we were jr. high and high school sweethearts which = volatile young love :D) I still couldn’t get enough of our song. The song is called “My Coco” and its by an indie rock band whose no longer together, named Stellastarr*. Its a wonderfully upbeat, dance-y kind of love song, the kind you workout to not just sway together to, and it’s on like 7 of my 10 Google Music playlists. I truly love it! In fact, I love every song by Stellastarr*. They’re whole discography reminds me so much of growing up, summertime and getting snow cones, and of course, of Nathanial. At the risk of this post getting entirely too cheesy, let me just finish off this introduction by saying I’ve always wanted to include the lyrics to this song somewhere in our bedroom. In our last house, I had this awesome plan to write the whole thing on the wall. I think it would’ve been beautiful and awesome but I’m really glad I didn’t since I really had to do enough re-painting in that home before we could rent it out. So whew! And our new bedroom no longer has that same vibe I was working with there, so a much easier, more minimal and graphic application was called for! Enter these simple lyrical pillowcases. This tutorial works great for absolutely any song so if you’ve been dying to make an ode to your special ‘song’, want to include bits of your personal favorite song in your decor, or maybe a lullaby for your kids, or just a snappy quote, this DIY is for you! Click through to see how! Lay out your layers in your desired pattern. I found it simplest to start with the middle line, get that centered and straight and then work on the other lines. I also used a straight tool to make sure my letters were level, any straight thing or ruler would work for this. Iron on the letters according to package directions. 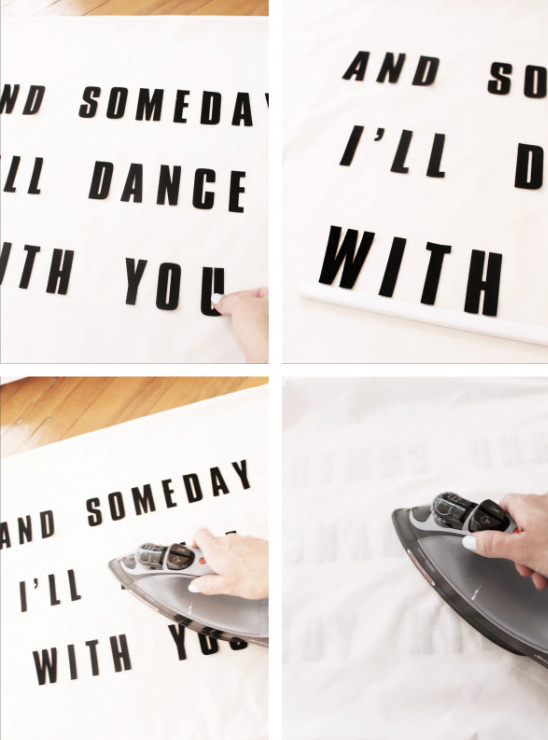 Turn your pillowcases inside out and continue to iron briefly for maximum adhesion. Do you have a special song, a favorite song or maybe a favorite quote that you can see putting on your bed? If so, I’d love to know what it is! And also, this song is the reason we named our daughter Stella. We’re just a couple of sappy kids. SO amazing! I absolutely love this idea! So inspired! Lyrics from our wedding song would be so special! Thanks for the idea!